Mimi Spencer is a prizewinning UK-based fashion and beauty journalist who has spent most of her life surrounded by models and celebrities. In her book, 101 Things to Do Before You Diet, she shares a collection of tips, tricks, and solutions to help you achieve a slimmer appearance, ranging from fashion advice to strategies for eating a healthy diet. This book is based on the idea that most women today know that starvation diets are not the answer for losing weight in the long term. Spencer realized that there are many factors that can affect our weight – not just how many calories we eat – so she endeavored to view weight loss from a holistic perspective to create a lasting solution. Some of the subjects she explores in the book include hormones, sleep patterns, psychology and habits. You are encouraged to evaluate “your relationship with your fork, your fridge, your fashion, your friends and your foibles”. The author also provides advice on how to approach dieting by just learning to love yourself first. Spencer also draws on her extensive knowledge from years in fashion journalism, sharing with readers ways to appear thinner, simply by knowing the tricks of dressing thin. One of the main concepts is to make the most of what you have and accentuate your positive features while downplaying the negative. Other fashion tips include getting fitted for a new bra, finding the right pair of jeans for your figure, always wearing high heels and dressing to suit your age. Nutrition recommendations encourage a healthy and balanced approach to eating where everything is allowed in moderation. Easy tips for reducing calories are provided with suggestions such as eating slowly, paying attention to what you are eating, always eating breakfast, practicing portion control, eating more soup and drinking less alcohol. The book also includes a list of options for healthy meals and a few recipes, as well as information about certain foods that can enhance fat burning. If you are going to indulge you are encouraged to choose things that have other benefits for your health such as dark chocolate or red wine. Oatmeal, whole wheat bread, spelt, quinoa, buckwheat, beets, eggplant, blueberries, grapefruit, apples, acai berries, figs, broccoli, olives, lentils, hummus, walnuts, almonds, pumpkin seeds, flaxseeds, eggs, yogurt, sardines, smoked trout, popcorn, dark chocolate, red wine. Regular exercise is something you should weave into your life and if you are not physically active you are encouraged to find an activity you enjoy. Energetic walking is known to be one of the best integrative exercises and taking your dog for a walk can be a great way to get started. You can also do strength training exercises, yoga and Pilates. It can help to decide which part of your body requires the most attention and target that area first so that you get noticeable and quick results for your efforts. 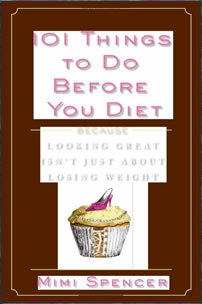 101 Things to Do Before You Diet: Because Looking Great isn’t Just About Losing Weight retails at $17.99. Offers tips on healthy eating and reducing caloric intake. Includes advice on what to wear to create a thinner appearance. Addresses the psychological aspects involved in eating behaviors and weight management. Encourages the development of a positive attitude and self-acceptance. Provides a collection of ideas and a few recipes for simple meals. Many of the tips do not provide any new information. Detailed nutritional guidelines and a structured meal plan is not included. Will probably not appeal to male readers. 101 Things to Do Before You Diet is a book containing a collection of tips, tricks and suggestions to help you appear slimmer and effortlessly reduce your intake of excess calories. It is a holistic approach to weight loss that will especially appeal to readers interested in fashion and learning what to wear to create a slimmer appearance.